Welcome to learn Chinese with me. I love your website! I am teaching Chinese to K,1, and 2 and have gotten some new ideas from visiting here! Do you know of a computer (font) program that will will write the Chinese characters after pinyin is put in (with tonal number marks). So if I were to put in ni3 hao3— it would put 你好 ? That is something I am looking for. 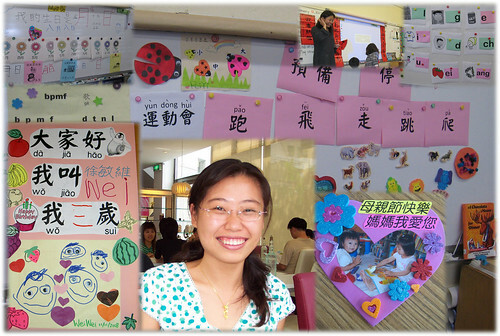 In the picture of you above, I like the way the posters have the pinyin and the hanzi. If you know of a font program, please tell me! I wanted to ask if you do Chinese tutoring. sorry I could not find your email. I heard of you from Kai Ning Chen. I ‘ve sent you an e-mail. Please check it. I’ve tested on PC, Mac, iPad, and Android and all the sound playbacks work fine. What browser/computer are you using? My sound issue could be that i am not able to log in to your site. are we suppose to log in? or can do without it. btw the log in link does not have a registration link. So i dont know/have a user id and no password.